You must have heard about the SmartScope, the little box that liberated Measuring Man from the wall outlet. Since it became available, anyone can take his 'scope on the road: a single cable turns a tablet, a laptop or a smartphone into an oscilloscope. Despite its colour, it ain't no black box. By giving full access to the software framework of the SmartScope, a whole new dimension of possibilities is opening up. 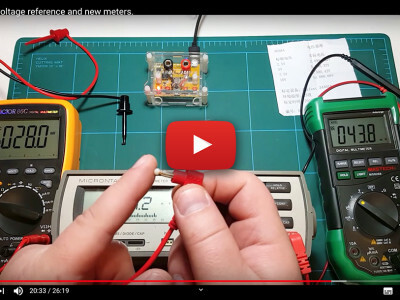 In this video, developer Riemer Grootjans explains several powerful features of the SmartScope. Starting with the mobile use with a tablet, he then demonstrates I2C decoding using a multiple temperature sensor board connected to a laptop PC, hooked up to the Smartscope as a logic analyzer. 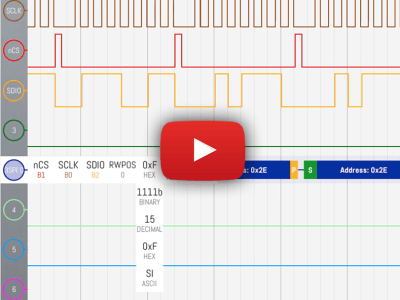 Further SPI decoding is briefly showed too, as well as recorded data export and arbitrary wave generator (AWG). 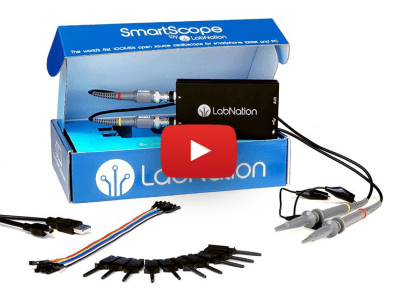 The SmartScope is an especially handy and affordable USB oscilloscope, logic analyzer and signal generator. 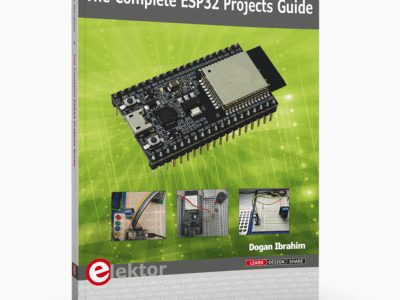 Internally the SmartScope is built around a powerful Xilinx Spartan 6 FPGA, which also makes it suitable for use as an FPGA development platform. 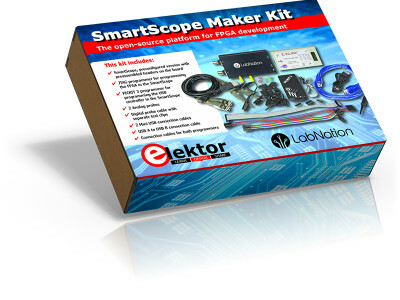 Elektor is now offering the unique SmartScope Maker Kit, which includes a special version of the SmartScope and two programmers with suitable cables. Most USB oscilloscopes have been designed for use in combination with a Windows or Linux PC. The SmartScope is an exception to this: it works just as well with an Android tablet, an iPad or an OS X system. The software has been designed to make the user interface appear identical across all platforms. We’ve tried one out on a PC and a tablet. 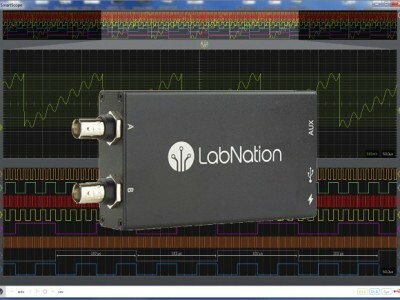 The SmartScope from the young Belgian company LabNation is a universal, two-channel, USB oscilloscope with many features. 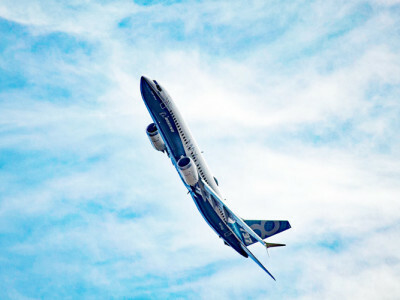 The accompanying user-interface software is compatible with virtually all computer platforms (Windows, Android, OS X, iOS, Linux) and is optimized for both mouse and touch interfaces. 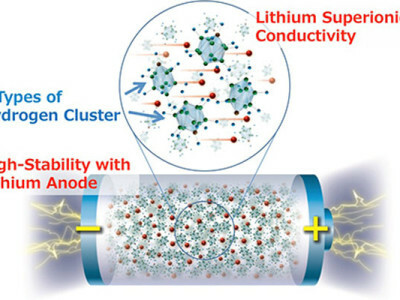 An extensive review of the SmartScope was featured in the July & August 2015 issue of Elektor magazine. 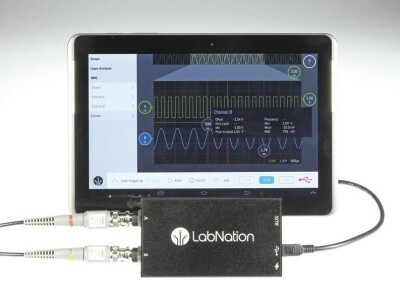 The SmartScope designed by the young Belgian company LabNation is — to our knowledge — the only oscilloscope that works with all popular operating systems: Windows 7/8, Linux, OS X, iOS (jailbroken) and Android 4.0+. So the software can run on a standard PC or laptop, but also on a tablet or smartphone. The control interface is specifically designed to operate with touch-screen or mouse and is equipped with various software decoders (such as I2C and SPI) for decoding digital signals.